As the smaller brother of the Austin Air cleaner "Healthmate", the plain-vanilla-value Austin Air Healthmate Jr. air cleaner has been selling well for years in essentially the same form. The Healthmate Juniors are three-filter-stage air purifiers with a vacuum-able prefilter. The Austin cleaner has the lowest maintenance HEPA/carbon air cleaner system. Austin Air cleaners lack electronic controls and air filter monitors, offering long term durability and economy instead. The core of the Austin air purification system is 6.5 lbs. of activated carbon/zeolite filtration. This amount of carbon is very rare in air cleaners under $400. A 30 square foot true-HEPA filter is combined in the same cartridge. The main weakness of Austins' combined air filter is that some HEPA is typically unused when the carbon has become saturated. Austin Air compensates for this with a prorated warranty which includes the filter. This is the only company I am aware of that does this. For the first two years, the company rebates 60% of retail cost, plus shipping. In the third year, 40% of retail cost plus shipping. If the filter clogs in the last year of coverage, it's a 10% rebate. Austin Air Healthmate Jr is not the best air cleaner, I reserve that title for IQAirs. But for those who place economy, low maintenance, assured safety, and reliable steady performance ahead of electronic automated interface, threshold straining ionic technology, and overwhelming short term sweeping power, Austins can be a good choice. As a chemical and particle sensitive (MCS) sufferer, I personally want and need the second half of that equation. I like ozone free negative ions, remote controls, and 10 air change or better quick sweeping power. But if you want value and low maintenance for a small room, Austins Healthmate Jr is it. Many people are making the mistake of installing the Austin Healthmate Jr in environments too challenging for small air purifiers. Austin wisely does not participate in CADR testing, which is biased against tight filters and heavy carbon. So the manufacturers claims are the main data available. The Junior system is rated by the builder at 125 cubic feet per minute of cleaned air on the highest of 3 speeds. Allergy Buyers Club tests products over a long period of time before approving them for sale. Their particle counter efficiency tests rated the Austin cleaners in the mid-80% to 90% area. Air Purifiers America published similar results. This is just good, not spectacular performance, substantially below the builders claims. But this performance will remain steady over the life of the Austin air cleaner. So we can calculate estimated clean air delivery rate (CADR) for comparison; 125 cfm x .88 = 110. AHAM has rule for calculating room size based on a CADR 66% of the room size rating. Austin claims this machine, running at 125 cfm, will clean up to 750 square feet. This equates to only 2 air exchanges an hour, running on high. My recommendation is CADR equal or greater than room size. That makes the Austin junior air cleaner perfect for a small 10 x 11 bedroom, 110 square feet. Put it in that room, plug it in, turn it on. Vacuum the exterior to clean the pre-filters once a month. Wash, not replace, the "permafilt" prefilter annually. In the 3rd year replace the air filter and prefilter using the 40% Austin warranty. If your air is cleaner than average, go the whole 5 years on filters. But smoking, toxic, wet, or moldy households can expect short filter life, 1 year or even less on filters. The combined Austin HEPA/carbon filter must be replaced as a whole, even if only the carbon is used up. Please be aware that the Austin air cleaning system, with its zeolite filters, cannot be installed in damp environments: Zeolite is a water adsorbing clay mineral which will swell up and clog in wet places. Also, room air cleaners cannot remove the multiple health hazards associated with secondhand smoke. 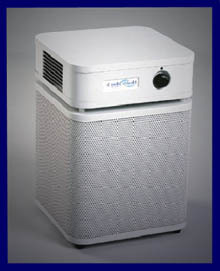 Smoke toxins will quickly clog every unit, electrostatic or HEPA/carbon, on the market. Even a good HEPA/carbon like the Health Mate will clog in a few months. Source removal is imperative, air purifiers come second. Austin systems are designed to vent in a concentrated stream, to provide a cleaned air zone for allergy attacks. Others may find this arrangement breezy. On high the Austin Air purifier consumes 80 watts of electricity. Using the estimated CADR above gives 1.4 CADR/watt, not an EPA Energy Star qualifier. With a height of just 16.5" and square at 11" x 11" the little Austin Air cleaner is a tidy package, easily integrated into the decor. The Healthmate Jr. weighs just 18 pounds, and is easily portable. These Junior air cleaners are available in three colors; black, white, and sandstone. The "Austin Junior" air cleaners are also available in a "Plus" version, with an extra $50 worth of Potassium Iodide for additional chemical filtration. A 5 year warranty covers parts, labor, and is prorated on the filter. There are quite a few five star reviews for the little Austins. I found a couple sour user reviews from the old epinions.com site, which demonstrate my view that many people who buy air purifiers have little understanding of their environment, and even less of the air cleaner market. In the interest of objectivity, and as a model for failure to be avoided, I post them here. Readers can learn from these unhappy examples: no air purifier can substitute for proper source identification and removal. User opinion: "I purchased the Austin Air Health Mate Junior after extensive research. I needed a product which could remove odors. My bedroom has a slight musty odor. After reading reviews and advertisements regarding other products, I thought I would never be able to find an air cleaner that would effectively remove odors. Then I came across Austin Air's product line. I was impressed by the advertised size, low noise level and HEPA capabilities, but most importantly, I was convinced to buy the product by its odor removal capabilities. When I got the unit home, while true to low noise levels, it did absolutely nothing for the slight musty odor in my bedroom. I even gave it two weeks, with the bedroom door shut, and left it on high (except when sleeping). Again, however, no help. I cannot speak to the product's advertised HEPA capabilities, as I generally do not suffer from house related allergies and I used the product when my seasonal allergies were not that bothersome. I therefore made the decision to return the product within 30 days. Unfortunately, the store that I brought it from, as well as Austin, refuse to refund my money. 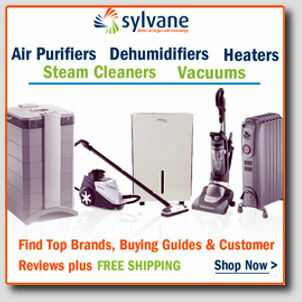 I now have a $270.00 air cleaner that does not clean the air as advertised." For a well-reasoned complaint like the above, Air-Purifier-Power offers a suggestion; have you evaluated the source of the "slight musty odor?" Maybe it is coming from a continuous emitting source like mold in your HVAC ducts, coil or evaporation pan. Did a pet ever live here, on this carpet? Musty odor generally implies a nearby damp basement, leaky plumbing, or other larger scope factor that room air purifiers cannot resolve. Years before air purifiers were common and I had MCS, I knew a guy who was always complaining about the odor in a hotel. This was before the non-smoking room and eco-hotel came into being. A group of us software guys were housed there by our company, staying in the same rooms every week. Everybody else loved the place. Finally, a few of us went to his room after dinner to check out the odor. We razzed him in the elevator about his dirty socks and personal hygiene. He got pretty belligerent and defensive. But the room DID smell. We turned it inside out, looking for dirty laundry to embarrass him. Finally, one guy looked under the bed and found a 1/3 eaten moldy large pizza still in the greasy delivery box. It was his own fault! A bit overweight, he was notorious for ordering pizza late and getting grease on the fancy plastic software manuals we all had to share. We laughed so hard it hurt: Hey, Leo, whadda ya say we order a pizza tonight? Please don't make the mistake of asking an air cleaner purchase to solve problems it is not designed to deal with. It looks to me like the company honors their very unusual warranty exactly as advertised. To avoid unhappy scenarios with any carbon/zeolite filter, find indoor air pollution sources and visit the nearest dumpster, THEN install the air cleaner. While not without flaws, few products are as widely respected and objectively supported as the Healthmates. Austin Air HealthMate Jr. at Amazon.com.